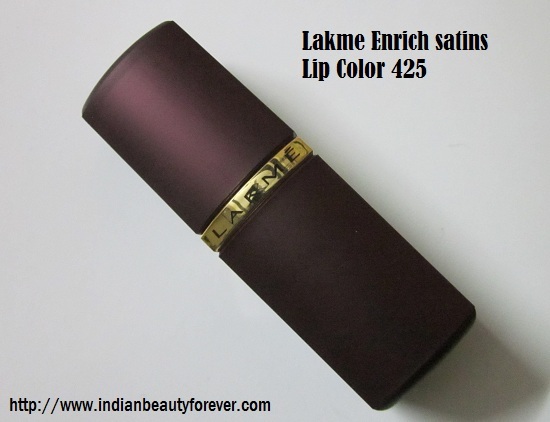 Lakme Enrich Satins Lipsticks have been here for a very long time as they come from our very own home brand Lakme. I got this shade no 425 from this range that I would review today. I remember checking this shade once at the counter long ago while looking for no 651 natural, but skipped the idea to buy it until a couple of days ago when I ordered it online. Online shopping is like a boon but when it comes to lipstick shade selection their shade card render useless and you may end up being like a victim, :D but thankfully I have seen the color before!! Price: 225 INR for 4.3ml with a shelf life of 24 months. 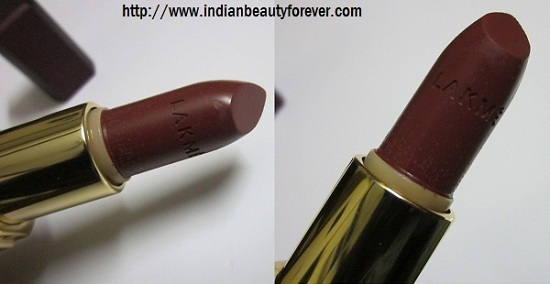 Brand Claims: Lakme Enrich Lip Color is enriched with vitamins, sunscreens, and olives. It has astounding satin texture. This product retains the natural moisture of your lips. It avoids lip darkening and offers your lips with a radiant shine. It offers UV protection thereby guarding your lips from harm caused by the sun’s harmful rays. Experience: These Lakme Lipstick comes in a regular age old packaging that looks okay but then boring as well. I realized that in pictures, somehow it looks beautiful as the golden and maroon kind of compliment each other against the white background. This color 425 is a deep Rusty Brown rich color. You can see the swatches below in the different lighting to judge it yourself. I find this color really beautiful and it compliments my skin tone. In fact this color may look gorgeous on Traditional Indian attire. This is a color which may I assume will suit most of us. However, that also makes it more prone to bleeding. In that case, A lip liner can be used to prevent it from bleeding. Pigmentation is decent but do not expect the same pigmentation in a single swipe, it may take at least 2 swipes to get the true intense rich color which is opaque enough to cover the lip pigmentation. Staying power is average for 2 hours maximum. 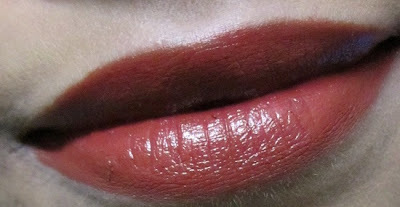 Sometimes I feel that the formula or the texture of this lipstick is more like a liquid lip color. I noticed that my 651 bullet was so delicate that while using it, It was uprooted! but this one seems to be sturdy! I could not see any stains once it gets wiped off. so, if you like some color on your lips even if the lipstick wears off then you may skip it!! Overall, this lip color from Lakme Enrich Satins has not failed to impress me in terms with its color, decent pigmentation and butter soft texture, which eliminates the requirement of using a lip balm before wearing lipsticks, if you have dry lips! I don't believe everything that the company says but yes it gives moisture and satin finish. PS: I have personally seen and noticed that Enrich Satins range of Lipsticks has inconsistency in the overall quality amongst the shades. So, I doubt if other shades have the same textures and pigmentation. It is easily available online, Lakme counters and drugstore.Well Lakme is sold even in the tiniest of the street shops. 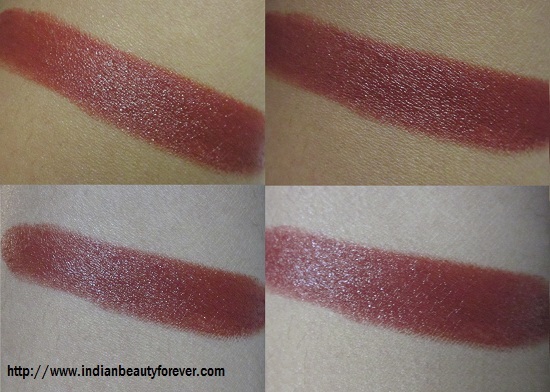 It has a decent pigmentation but the opaque and luxurious color is still possible to achieve with a couple of swipes. This color will suit most of the skin tones. Packaging is okay but then, it could have been better to change it now. Prone to bleeding due to super buttery texture. My Take: Need an affordable, decently pigmented though a bit low on staying power then, this can be definitely considered. Color itself is beautiful enough to suit most of us and if not this then you may try others from this range. For me it's a good shade and product which I would call worth my money!! they are very satiny creamy na that makes them low on staying power. try it Prayati. Hope you like it too!! I always wanted to try these. but never bought a single one from this range. I am doing good.. just a bit busy yesterday. Lovely Shade !! pretty pout you hv ! Nice shade, but it's sad to hear that it doesn't last long.. I think its time for the company to change or redesign the packaging. Love this shade, tempted to go out and buy one too! try them, they are not that bad..